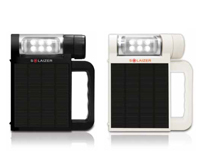 This product is a solar energy rechargeable lantern comprised of solar cell, battery and LED lamp. Battery is charged by solar cell to operate the LED lamp. When fully charged, the solar lantern cam be used up to 11 hours in regular brightness. * Click here to see a pdf file containing Solaizer_LED LANTERN Catalog -ENG. * Click here to see a pdf file containing Solaizer_LED LANTERN Catalog -KR. * Click here to see a pdf file containing Multi Functional Device Catalog -ENG. * Click here to see a pdf file containing Multi Functional Device Catalog -KR.